One night, in the mid-90s, I was hanging out at my friend's home. She had invited other people over, and I supposed these things are called "parties". I was never a party kind of guy and I arrived early. At the time, radio was very much about playing hip hop or watered-down alternative pop. I thought to myself that maybe other people would share my interest in avoiding pop radio. So I brought some CDs to play in case these other invitees - none of whom I knew - wanted to hear good music. When they arrived I had already been playing one of my favorite albums, "2112" by Rush. If anyone has heard this album, you already know why this story is embarrassing. At the 12 or 13 minute mark of the title track, some guy turned to my friend and asked in an agitated voice, "What is this?" Obviously he wasn't intrigued. I was sitting somewhat close to the radio and I'm sure I turned red. I tried to act nonchalant and said to my friend, "It's not for everyone." I took out the CD and left the area. I don't remember much else from that night. I've had my fair share of embarrassing moments, but this one in particular is a perfect description of why the band Rush never got past cult status. 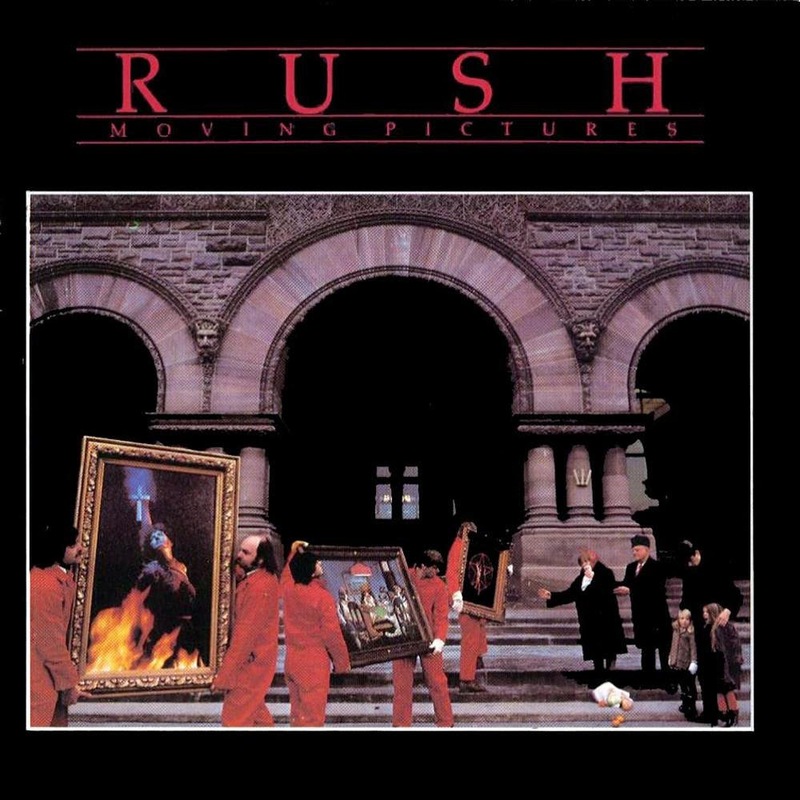 Although they've had commercial success, in particular with their album, "Moving Pictures" thanks to their hit song, "Tom Sawyer," Rush was never a pop band. The majority of their albums are an acquired taste. Rush was founded by Geddy Lee (vocals, synthesizers, bass), Alex Lifeson (guitars), and John Rutsey (drums). 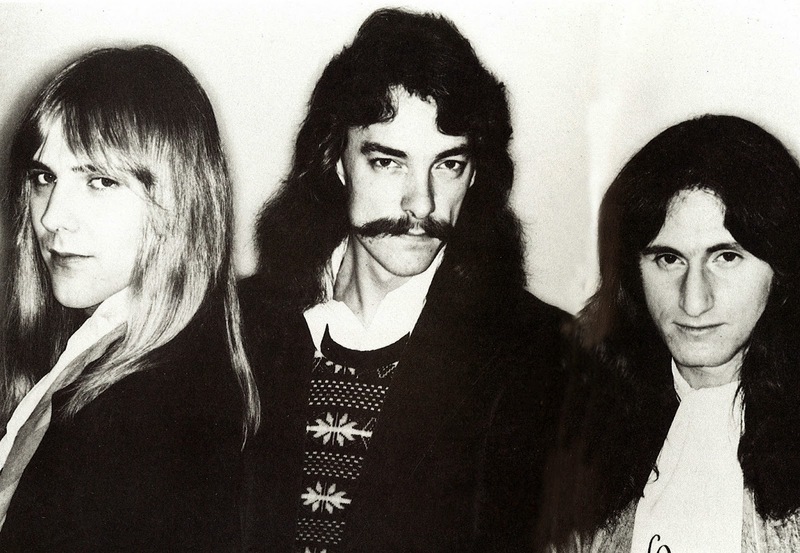 After replacing Rutsey with Neil Peart in 1974, the Canadian trio has remained together ever since. And though there's not an exact name for their style, it's safe to place them within the Rock category. 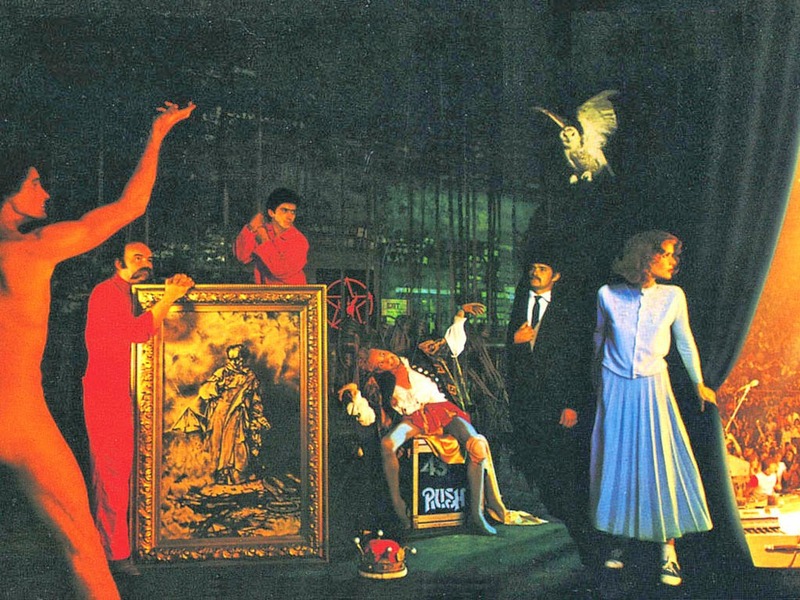 With a catalog as extensive as Rush's, it's difficult to choose an album, or list of tracks, to focus on within one article. Instead, I'll focus on their 1981 live album, "Exit...Stage Left." Even though I had been familiar with some of their music, it wasn't until my late high school years that I discovered "Exit...Stage Left". It remains one of my favorite live albums from any band, and is an incredible introduction to a rock band with literary and science fiction sensibilities. Below are some of my favorites from this list. Starting with the first track, "The Spirit of Radio," Rush kicks off this live album with full energy. Lifeson's guitar riff gets the heart pumping in such a way that, as a listener, you wonder how the album could start with any other track. And honestly, it couldn't - it had to be "Spirit of Radio." Within a few bars, Peart and Lee join in, and after its initial introduction with the drums stumbling and bass jazzing around, the song is well on its way. The music is exhilarating and performed by three incredible craftsmen. The lyrics speak of the freedom of music, and of the restrictions of criticism. In other words, music shouldn't be about profits, and about believing what people say about the music. Music is an individual thing and it allows you the ability to love the music that makes you happy. A great message, coming from a band who never received praise from critics, and yet have maintained a solid fan base. Another personal favorite track is the instrumental, "Broon's Bane", which is somewhat of an extended introduction to the track "The Trees". Titled after their music producer, Terry "Broon" Brown, the track is a beautifully written piece by Alex Lifeson. The acoustical piece has a dark feel to it, highlighted by touching moments. Though Lifeson is known by fans as a great guitarist, he's generally underrated. This piece showcases his playing, sensitivity, and song-crafting abilities. The track is followed by one of the best renditions of "The Trees". The song is an unsubtle metaphor for the struggle between upper and lower class cultures. Musically the track ranges in emotion, from light and honest to dark and crude. It's a beautiful message about the yin and yang of life. One of their most famous tunes, "Closer To The Heart", begins with an acoustic guitar, but after the first verse the song intensifies with an electric guitar. Lifeson gets to show off some of his solo work in the track, but it's the combination of all three musicians that makes the song work so well. It's one of their more accessible tunes, and proves that they can indeed reach large audiences. 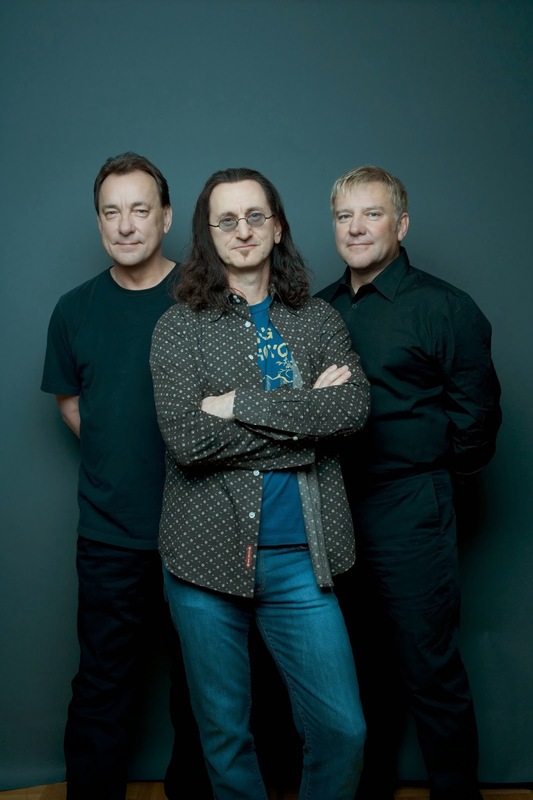 "Tom Sawyer" is a perfect example of Rush straying from conventional songwriting and still connecting with an audience. It's arguably their most famous tune, and it's instantly recognizable, thanks to those distinctive synthesizers. It's also another great track that highlights the trio playing their instruments with precision and expertise. Besides Alex Lifeson's guitar playing, the band is also famous for having one of the best bassists and drummers. Neil Peart, specifically, has been recognized by many fans, critics, and musicians as being both innovative and influential. Of course, Peart humbly decided, despite his status as a expert drummer, to go back and study with jazz drummer Freddie Gruber. Gruber helped Peart enhance his playing to a more fluid style, allowing each stroke to dance, instead of cut, through the air. Prior to his Gruber lessons, however, Peart had established his reputation as a renowned drummer throughout the Rush catalog. Many of the lyrics were also written by Peart, which many newcomers may find surprising. As a band whose main goal is to further explore music and push their talents to the limit, all three members were given the freedom to experiment and develop as musicians. Peart, in particular, became famous for his drum solos, notably for the one found on their track, "YYZ" (pronounced Y-Y-Zed). The second track on this live album, and a perfect follow up to "Spirit of Radio," is "Red Barchetta." The song, which is about a car, freedom, and a young man's dream about racing in a winding road, begins with a muted guitar riff. The song's musical journey parallels with the lyrics and revs up as the engine roars. The instruments seem to imitate the sounds of an automobile. This, again, is Rush using their instruments to tell a story in a way that only a band so comfortable with their tools can produce. The entire live album showcase Rush's ability to craft rock music with energy, heart, and brilliance. And though I've highlighted just a few of the tracks, those unfamiliar with "Exit...Stage Left" should invest some time appreciating other tracks like "Xanadu," "Beneath, Between & Behind," "La Villa Strangiato," and "Jacob's Ladder". Quite frankly, it's difficult to explain in one article all the reasons Rush is worth appreciating. Even just highlighting one album such as "Exit...Stage Left" is an impossible task in itself. In fact, it's doubtful anyone could ever accomplish a definitive collection of Rush, but the 2010 documentary Beyond the Lighted Stage comes close. Directed by die-hard fans Sam Dunn and Scot McFadyen, their documentary covers Rush's music, as well as the trio's individual lives - from good times to bad, from early days to modern times. They also capture great insight from fans, celebrities, and ultimately the fact that Rush is truly a geek's band. And Rush never think otherwise. They know they're not the hot guys in tight, leather pants. There's a great line at the end of the film, and the end of the trailer below, when someone asks, "What's the motivation to keep doing it?" Alex replies, "Chicks." The joke being, of course, that they've never done it for any other reason than for the music. 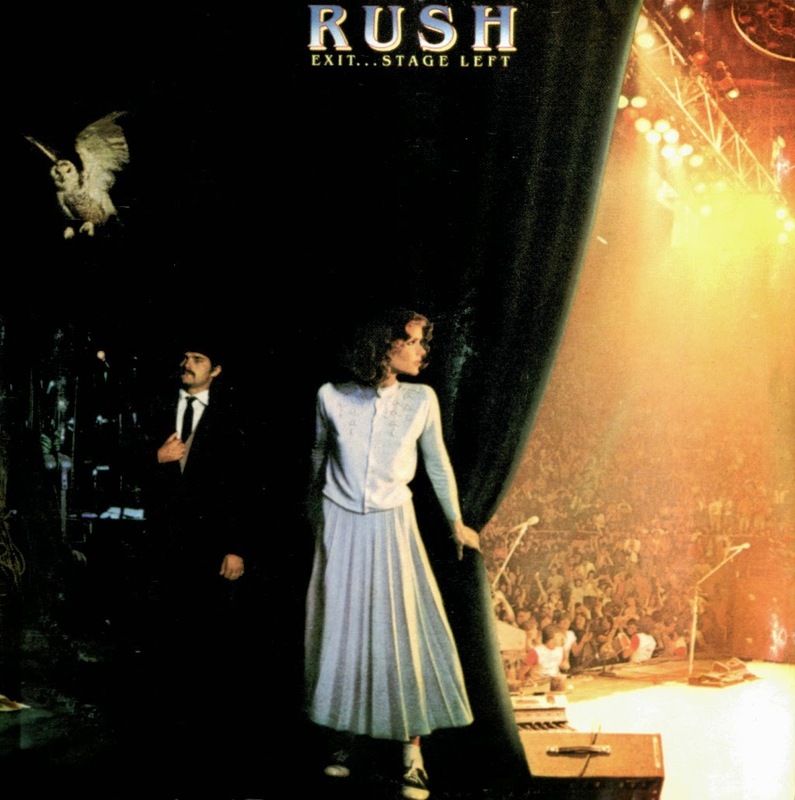 TRIVIA: The design for the album cover of "Exit...Stage Left" contains elements from their previous releases, including the owl from "Fly By Night," the woman from "Permanent Waves," the gentleman with the bowl hat from "Hemispheres", and many more. BONUS TRIVIA: Alex Lifeson appears as himself in an episode of Canadian television show "Trailer Park Boys". He also appears in Trailer Park Boys: The Movie as a police officer, and as an undercover prostitute in Trailer Park Boys: Countdown to Liquor Day.